The man who hit the first home run at Fenway Park was a native of North Grafton, Massachusetts: Hugh Frederick Bradley. Bradley’s parents were Joseph A. Bradley and Sarah Nutting Bradley and they celebrated his birth on May 23, 1885. Hugh had one brother, John E. Bradley, 11 years his junior. He played baseball for the Spencers, the semipro town team for Spencer, Massachusetts, earlier in the 1904 season. There he made a remarkable showing, his batting average being .361, and his fielding average 1000, accepting 87 chances. Bradley attended the College of the Holy Cross in Worcester, Massachusetts. Bradley had an abortive start to his pro baseball career. In 1905, he was one of five outfielders who tried out for the Norwich Reds team in the Connecticut State League. The season opened on April 28 but Bradley wasn’t in the lineup. He had made the team but left after just a couple of days to seek a tryout with South Manchester. Apparently, he injured his right hand after a month and had to quit playing. Later in the summer, he is reported to have played some in the Maine Central League, batting .450 in limited action. Bradley’s first full-season professional team was the Worcester Busters of the New England League, a Class B team that was also having its first season. The regular season began on April 27, and a host of dignitaries were present, including the Massachusetts lieutenant governor and Boston’s Mayor John F. Fitzgerald. The Busters finished the season as New England League champions. In the postseason, the Worcesters played the Connecticut State League leaders, the Norwich Reds, but Worcester was “off-stride” and went down to defeat in the Inter-League Series. Bradley did little to help his team. All in all, he seems to have played serviceable ball in 1906, collecting 106 base hits for a .243 average in 113 games, but he rarely stood out in any way whatsoever. After the season was over, Bradley took a position as a clerk in a Thompsonville, Connecticut hotel. He planned to do some coaching of high-school teams on the side as he waited for the 1907 season to begin. Bradley played out 1907 with Worcester finishing the year hitting .285 with 112 hits (30 for extra bases, but without a home run) in 393 at-bats. One of his better days came on August 12, when he hit third in the order and produced two doubles and a single. Worcester once more won the New England League pennant. Come 1908, though, Bradley was once again at first base for the Busters. For the third year in a row, Burkett’s Busters led the New England League. In 1909 he jumped his average dramatically to .312, hitting safely twice on July 24 to pass the century mark in hits. He finished the year with seven home runs and tied Brockton’s Simeon Murch for the league lead in hits at 144, Bradley batting cleanup much of the year. On September 1, the Red Sox drafted Bradley, pitcher Fred Anderson, and shortstop Steve Yerkes. Jake Stahl was expected to play first base, with Bradley prepared to back him up. 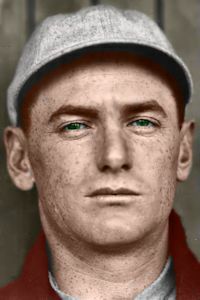 Hugh’s first major-league appearance came on April 25, 1910, when he was sent up to pinch-hit for Smoky Joe Wood in the bottom of the eighth. Brad finished with a .169 average in 83 at-bats, though steady in the field with only one error in 189 chances. Bradley was already noted as a singer and spent the winter months on the vaudeville circuit in New England. He was offered a Red Sox contract for 1911 and signed it at the beginning of January. Stahl said he was retiring and manager Donovan initially penciled in Brad as the everyday first baseman. For 1911 the Red Sox teams engaged in an astonishing 64 preseason contests, winning 41 of them, playing games in Utah, Nevada, Nebraska, and even in the Arizona Territory. To while away the time in travel to the West Coast, it was Bradley who took the lead in forming a barbershop quartet with teammates Buck O’Brien, Marty McHale, and Larry Gardner. Bradley suffered a “serious injury” near the end of the spring training trip, and lost his shot at a starting role. He took advantage of his moments, though, hitting for a .317 average and scoring nine runs to 1910’s eight. After the season, the Red Sox Quartet really got to work. Bradley was joined by Buck O’Brien, Marty McHale, and a new pitcher named Bill Lyons, who took Gardner’s place when the third baseman had to return home to help his ailing father. They performed several shows at Keith’s Theatre in Boston, and headed from there to Philadelphia. It looked as if 1912 would be the year that Bradley might finally get to play major-league ball on a regular basis. Stahl was still retired in Chicago, active as a banker. New club president Jimmy McAleer had other objectives. Just a month later, as it happens, the new owners of the team determined to lure Stahl back and did so successfully, hiring him as field manager on November 10 and even granting him a small ownership stake in the team. He would become the only player/manager/owner in Red Sox history. Jake Stahl returned to the Red Sox in 1912, to manage and play first base. Clyde Engle joined Bradley as a backup infielder. Even so, Bradley had his busiest season yet, with 137 at-bats in 40 games. Most importantly, Bradley made his mark in history by hitting the first homer ever hit at Boston’s new Fenway Park. The date was April 26. It was only the fifth game played at Fenway. The dominating feature of the brand new ballpark was the high left-field wall, just 310 feet or so from home plate, but with an imposing height of 31 feet. The original rendition of the wall was a 25-foot wooden barrier set atop the six-foot berm or earthen incline which took on the name Duffy’s Cliff for the Red Sox left fielder who learned how to play this original version of the warning track in front of the fence. This was baseball’s Deadball Era, when home runs were few and far between, and many of them were of the inside-the-park variety. The Red Sox as a team hit 29 homers all season long, Tris Speaker’s 10 roundtrippers leading both the pack and the league. He was only the third Sox player to ever reach double digits. Jake Stahl had hit 10 in 1910, and Buck Freeman had done it three times, 1901 (12), 1902 (11), and 1903 (13). Some analysts, scoping out the new park, wondered if anyone would ever hit one over the wall. It didn’t take that long, and came off the bat of the unlikely Hugh Bradley, he of the one career home run to date. It was, as it played out, the last homer he ever hit in major-league ball. It was. 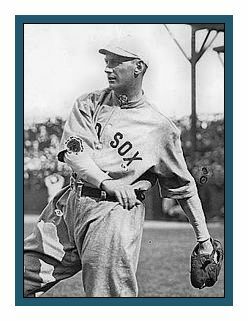 On May 24, Rube Oldring of the Athletics hit one that the Globe described as clearing the wall “at almost the same spot that Bradley sent it to beat the Athletics four weeks ago today.” Duffy Lewis hit one out on July 2 and Jake Stahl hit one out on July 20. Though none at all cleared the fence in 1913, four homers had been banged out in the first three months of Fenway Park. Bradley’s will forever be the first. Bradley hit only .190 for the year, primarily filling in during a stretch when Stahl was hurt, and by July the Sox were looking to move him. Brad saw no action in the World Series against the New York Giants, which the Sox won in eight games, though he collected a share which he planned to spend on real estate in the Worcester area and for some new stage clothing as the Quartette (now comprised of Bradley, Buck O’Brien, Bill Carrigan, and Heinie Wagner) planned on a two-month tour attracting what Bradley himself described as “the highest salaries ever paid for an act of this kind.” The Quartette toured, even though Brad was not a member of the Red Sox. In 1913, Bradley played with Toronto and in mid-February 1914, Toronto manager Joe Kelley said that Bradley was on the market. Brad became intrigued with the idea of the nascent Federal League, hoping to mount a challenge to the established National and American Leagues as a third major. There were rumors that he was going to play for the Chicago Federals, the Whales, but he was signed by the Pittsburgh Rebels. In 1915, Pittsburgh moved up to third place in Federal League standings, finishing just a half-game out of first, just four percentage points (.562) behind the second-place Chicago Whales (.566). But Konetchy had supplanted Bradley on first base, hitting .314 with 10 homers and 93 RBIs. Brad got into 26 games, batting .273. He drove in only 6 runs and on June 22, he and former St. Louis Cardinal Eddie Holly were both unconditionally released. Hugh Bradley wasn’t finished with baseball yet, though, nor were his legal troubles over, either. The Toronto owner was still pursuing a claim against him in the middle of 1916, arguing that Bradley’s contract still belonged to the Maple Leafs for having deserted Toronto to jump to the Federal League. In March 1916, he signed with the Columbus Senators (American Association) to play first base. Brad played in 1917 for the Omaha Rourkes in the Western League. The following year, he was out of baseball, perhaps involved in some way with the war effort or, more likely, simply unable to find work given the small number of teams operating during this wartime season. He played Class B ball in the Texas League in 1919 and in 1920, Bradley moved back up a notch to play A ball for the New Orleans Pelicans and for the Nashville Volunteers in 1921, appearing in only 25 games. Bradley’s last years in professional baseball were in the Florida State League with the St. Petersburg Saints. It was during 1923 that Brad homered for the last time. Brad took up work as an umpire, working in the Eastern League beginning in 1927; he officiated at the season opener in New Haven. He was dropped from the umpire list in 1928, but was back again in 1929 and again in 1931. In the years after his playing days were done. Bradley held a number of jobs. He worked as playground director at Worcester’s Logan Field, and worked with many boys who went on to play with high-school and semipro teams in the area. He was a member of the Worcester Retired Professional Baseball Players Club and spoke up on behalf of umpires (based on his own Eastern League experiences and perhaps aware of his uncle Foghorn’s umpiring career), leading an appeal in the middle 1940s for them to be included in the National Baseball Hall of Fame at Cooperstown. In February 1947, three-quarters of the old Red Sox Quartet reunited at the Boston Baseball Writers Association, and Gardner, McHale, and Bradley entertained the writers with songs of days long gone. Bradley died of a heart attack at City Hospital in Worcester on January 26, 1949. At the time of his death in 1949, Bradley was employed by the Wright Machine Company, a long-established metal machining firm based in Worcester.